Archives : SHOW OF STRENGTH - 28/03/2014. SHOW OF STRENGTH – 28/03/2014. As expected, the market exploded this week and the intermittent target of Nifty 6700 was reached with ease. This week the market completed Bullish Flag pattern on the daily charts and the potential target for that falls at Nifty 6912 and on the higher side 7191. The market movement clearly reflects the strength shown by the bulls. After witnessing a strong multi-year breakout in the early part of March, the market is now building on to that. Interestingly the euphoria associated with such strong bull moves is missing this time which clearly indicates that the market still has a long way to go. Sensex opened the week at 21827, made a high of 22363, low of 21827 and closed the week at 22339. Thus it registered a strong weekly gain of 584 points. At the same time the Nifty opened the week at 6510, made a high of 6702, low of 6510 and closed the week at 6695. Thus the Nifty closed the week with a strong gain of 201 points. On the daily charts, both Sensex and Nifty have formed a white body candle in line with the uptrend. On the weekly charts both the indices have formed a big Opening White body Marubuzo which indicates that strong bullish momentum remains intact. Hence both daily as well as weekly charts suggest bullishness in the near term. This week both the indices completed a Bullish Flag pattern when Sensex closed above 22023 and Nifty 6562. The pattern has a potential target of atleast Sensex 23126 and Nifty 6912 and on the higher side Sensex 24083 and Nifty 7191. These targets are likely to be achieved as long as Sensex remains above 21573 and Nifty above 6432. Pattern formation is a dynamic process and this week witnessed completion of Rising Wedge formation in weekly line chart. Rising Wedge has a natural tendency to give a bearish breakout but here it has given a bullish breakout and hence one can expect a strong upmove towards a potential target of Sensex 24429 and Nifty 7326. This week, both Sensex and Nifty managed to remain above the short term average of 20dma (Sensex – 21787 and Nifty – 6498), the medium term average of 50dma (Sensex – 21121 and Nifty – 6284) and the long term average of 200dma (Sensex – 20279 and Nifty – 6034). Thus the trend in the short term, the medium term and the long term timeframe continues to remain bullish. MACD and ROC are both positive and continue with its Buy signal. RSI (78) has reached overbought territory since the start of this week. MFI (56) is hovering just above the equilibrium line suggesting that the money flow remains positive. Stochastic Oscillator is also in overbought zone as %K is at 91. ADX (36) has increased further, suggesting that the uptrend remains very strong. The Directional Indicators continue in Buy mode as +DI continues to remain above -DI. OBV continues in Buy mode making higher top higher bottom formation. Both the indices continue with Buy signal on Bollinger Band. Since the Oscillators are in overbought territory, one can expect some weakness in the short term and if that happens, then one should use that as an opportunity to buy into the market especially the midcap stocks. The Nifty O.I. PCR is at a level of 1.06 which points towards bullish bias prevailing in the market. For the April series, highest Open interest build up is seen at 6400 Put and 6700 Call. This suggests that the market expects a trading range with support coming in at 6400 levels and resistance around 6700 levels. On Friday strong Call writing was witnessed at the strike of 7000 and some unwinding of the 6700 Call. Thus if the Nifty continues to remain above 6700, then it will have a potential target of 7000. 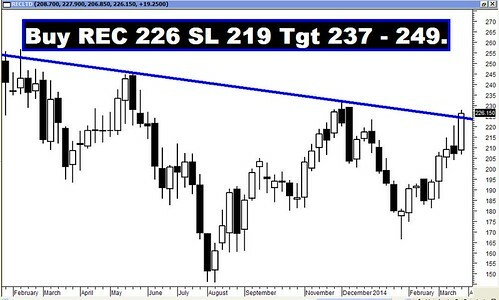 The Trendline Support for the Sensex is at 21302. The Trendline Support for the Nifty is at 6347. For the week ahead, Sensex will find Support at 22040-21725-21483 and will find Resistance at 22676-23003-23296. For the week ahead, Nifty will find Support at 6575-6481-6406 and will find Resistance at 6777-6873-6949. All the Recommendations of the previous week did well in reaching their targets with ease except for Great Offshore. But the Star performer of the week was JSW Energy which went up by around 11%!! !